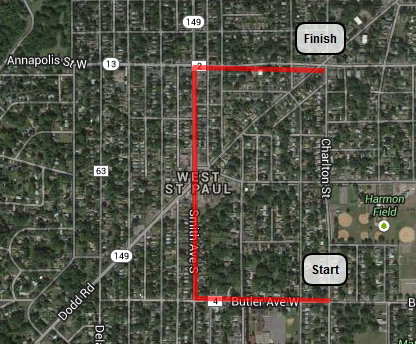 Because of construction on Robert Street, the West St. Paul Days parade will be moving to Smith Avenue this year (and possibly for a couple of years after that). The new proposed route will start at Charlton and Butler, travel down Butler to Smith, then follow Smith to Annapolis, ending at Charlton and Dodd (near Gallagher’s and Taste of Love). The parade takes place Saturday, May 18 17 at 1 p.m.
Informational meetings will be held at the Cherokee Tavern on March 18 for businesses and March 20 for the general public. Haven’t seen any information on bus detours, but I have an inquiry into Metro Transit. I’ll post info as soon as I find out. For more information, call 612-710-7043 or go to www.celebrateweststpaul.org. 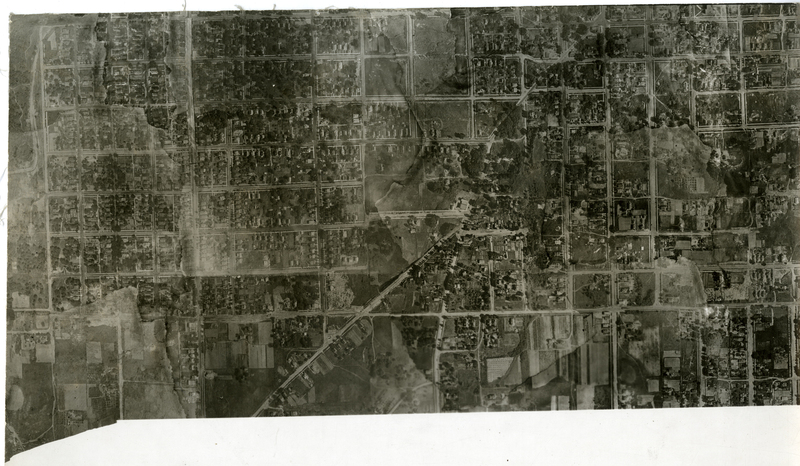 The University of Minnesota has recently put thousands of historical aerial photos online, and a handful of the capture the Smith Avenue neighborhood at a time of historic transition. 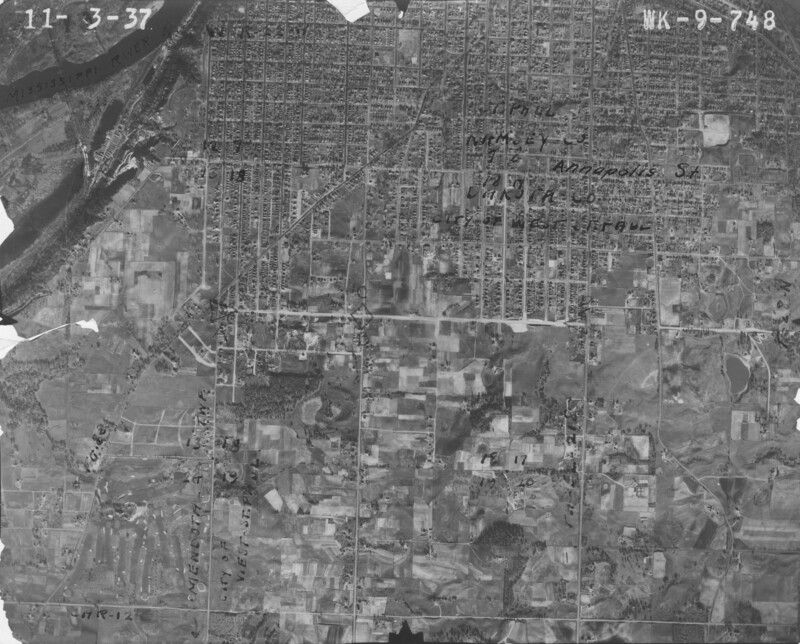 The Minnesota Historical Aerial Photographs Online database has more than 113,000 images taken throughout the state over the past century. While not quite the same resolution as the satellite images we’re accustomed to today, the level of detail they reveal is remarkable. 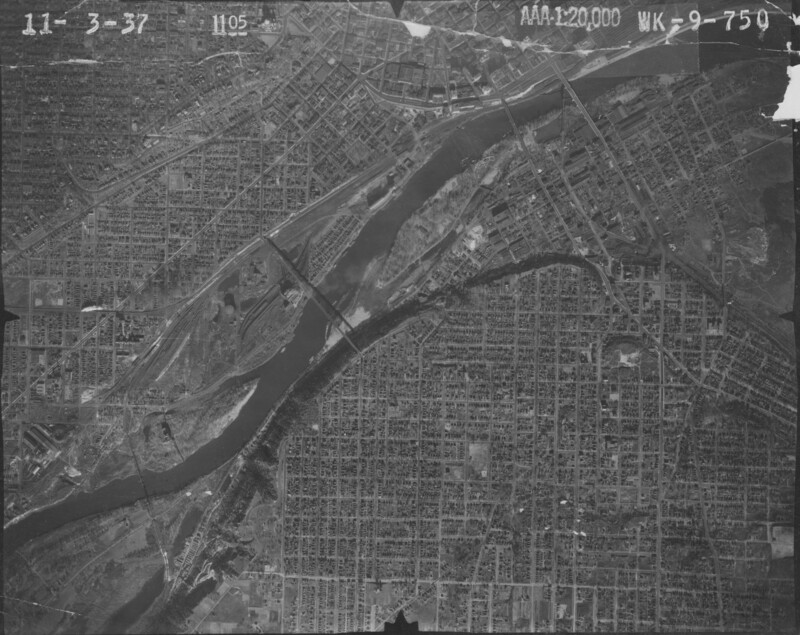 I’ve posted some low-resolution screen captures below of some of the images depicting our neighborhood. You can click on some of the images to enlarge them a bit and explore in more detail. The links to the originals are also at the end of the post. 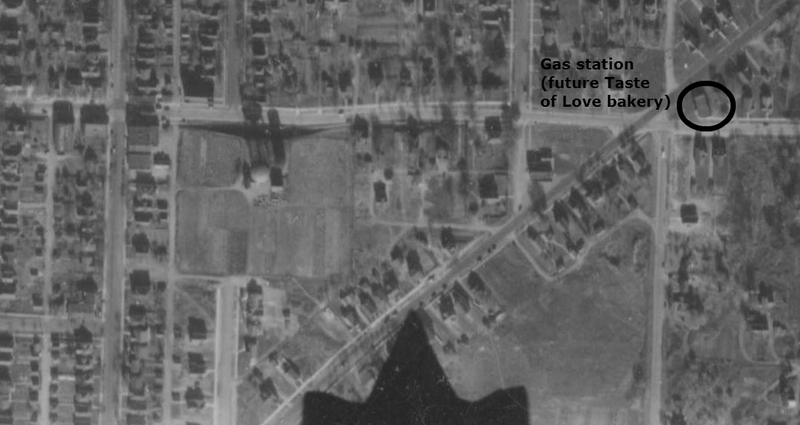 This shows the neighborhood in its youth. If you look closely you can see the building currently housing Amore Coffee (at the time, I believe, it was a drug store). 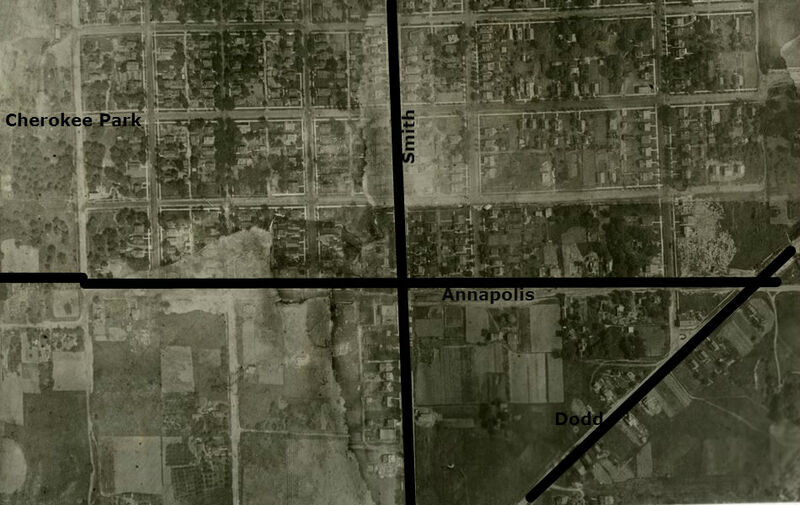 At this point much of the area south of Annapolis is still farmland and orchards. You could buy a country house and still be walking distance to the streetcar. These were the suburbs of their day. You can see how quickly things changed in less than 15 years – the dirt paths, fields and orchards south of Annapolis are filled with new, tidy middle-class homes, and businesses are thriving at the streetcar terminus. And also the top of the High Bridge. You can’t see it here, but if you look at the original you can see the shadows of the bridge’s trellis supports over the Mississippi River. Anyway. This is just a snapshot (pun intended) of what’s in the archive. 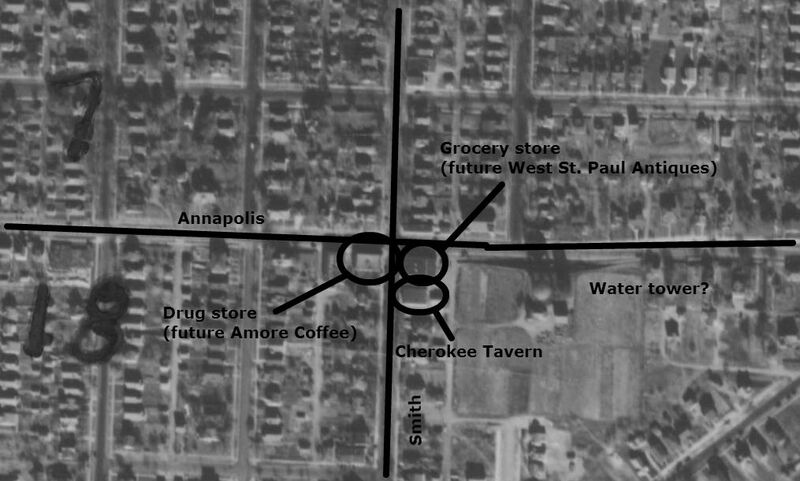 There are more images of West St. Paul, including some shots of Robert Street in the 1950s, still wide open and rural, with nary a chain store in sight. 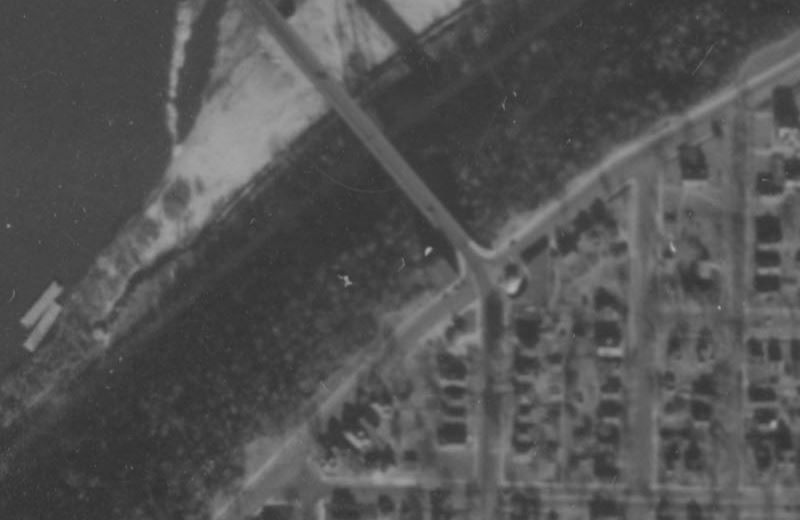 Bill Lindeke of Streets.mn has used the database to show the evolution of the Ayd Mill Road/I-35E interchange (which provided the inspiration for this post). St. Paul bike plan: What’s in store for Smith Avenue? The City of St. Paul recently released its draft bikeways plan, which provides recommendations for new and improved facilities to accommodate increasing numbers of cyclists. This was also a regular topic of conversation during the drafting of the Smith Avenue revitalization plan a few years ago. Because of its topography, the neighborhood is a popular training route for competitive cyclists, but there are also a fair number of everyday bike commuters (disclosure: I’m one of them) and recreational cyclists. 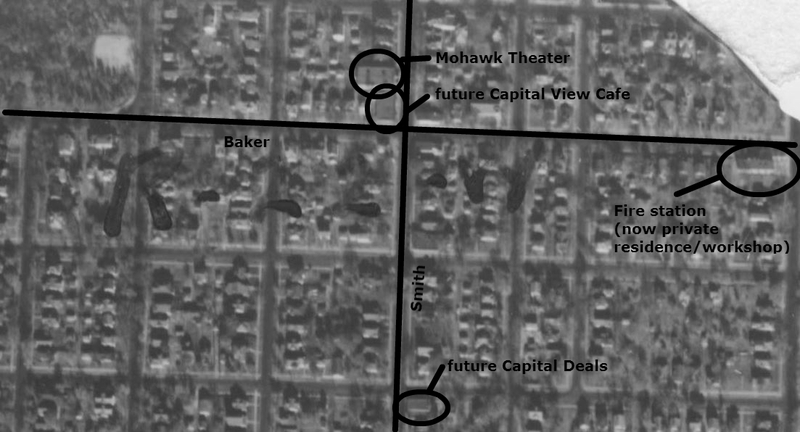 Smith Avenue is also home to Capital Deals, the only bike shop on St. Paul’s West Side. The neighborhood’s revitalization plan stops short of recommending specific bike routes, instead calling for “safe bike routes for all users” and recommending study of a bike boulevard parallel to Smith Avenue. We considered several possibilities for bike routes on Smith Avenue itself but it would be virtually impossible to do without disrupting the street parking that several businesses depend on. The green line is the existing Cherokee Regional Trail. 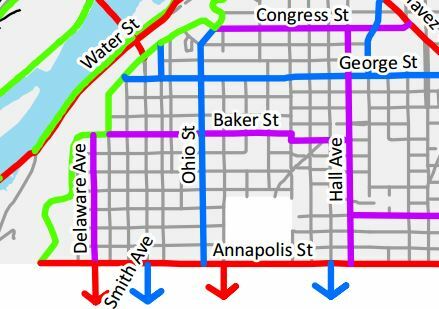 Red lines are streets recommended for bike lanes (Annapolis and the High Bridge). Blue lines are “enhanced shared lanes” which use pavement markings and signs to indicate the presence of bikes (Ohio, George). And purple lines (Delaware, Baker) are “bike boulevards,” which are streets designed to prioritize non-motorized transportation and discourage heavy car traffic. It’s this last designation that’s liable to stir up the most confusion, because a bike boulevard can be comprised of many different designs. Bike boulevards in West Coast cities sometimes use curbs and roundabouts to calm traffic. In practice in Minnesota, the results are less dramatic (the need to plow snow keeps us from getting too fancy with the pavement). Important thing to keep in mind is that these streets don’t ban cars outright, they just discourage through traffic, much like a suburban cul-de-sac. The bike plan does diverge from the Smith Avenue revitalization plan in one important respect, however. The proposed routes running parallel to Smith are both three blocks away, which may be too far away to funnel bike traffic toward neighborhood businesses. Wayfinding signs may solve this, but Ottawa or Manomin may be other options worth considering. This is just a draft, and if adopted will become an addendum to the city’s comprehensive plan for future development. There is no timetable for implementation at this point, no guarantee any of this will become reality anytime soon. If you have feedback on the bike plan, there are three more public forums coming up soon, and you can also submit comments in writing. All of the maps, documents, and other information you need are right here. 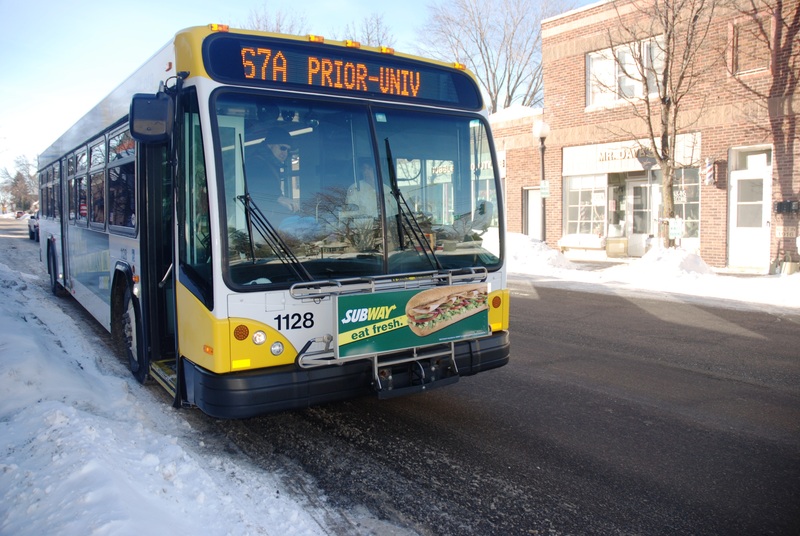 The Route 67 bus — Metro Transit’s “Route to Relaxation” — serving Smith Avenue is among the routes that will change on June 14 when the Green Line light rail service begins between St. Paul and Minneapolis. What’s happening to the 67, you ask? Currently, when the 67 arrives downtown, it continues west along Thomas and Minnehaha and dumps you out in Midway somewhere. After June 14, that western portion of the route will continue and combine with the Route 8 bus serving Franklin Avenue in Minneapolis. You can see a map here. The 62, which currently serves Rice Street and ends downtown, will continue from downtown to the West Side along the old 67 route. The 62 has longer hours and greater frequency on Sundays, but don’t get too excited, the portion serving Smith Avenue will still have essentially the same service hours as the 67 does now. So if you use the 67 to get downtown, there shouldn’t be any significant changes other than a different number on the front of the bus. I wouldn’t rule out minor schedule changes though, so be sure to double-check the schedule online before the changes take place this summer.